The call came in from MC2. 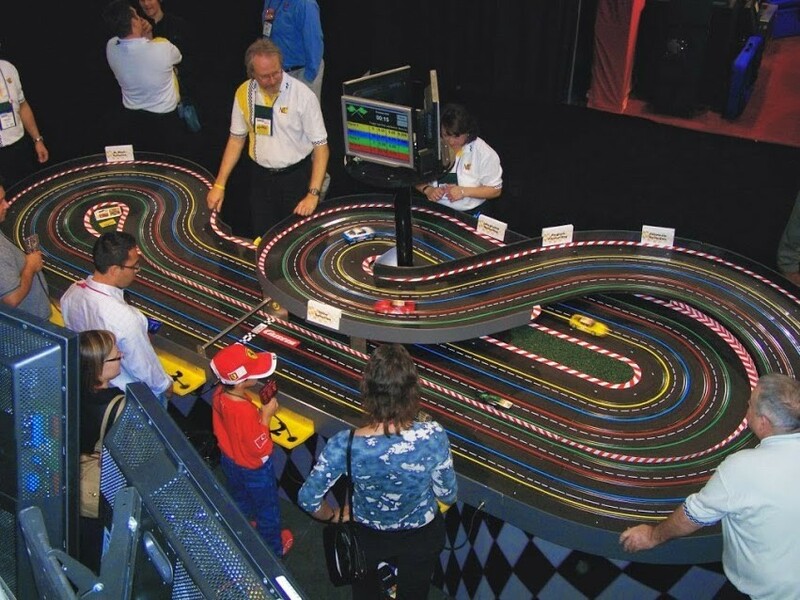 They wanted a slot car track feature as the centerpiece for their booth at the most incestuous trade show of all. That is, of course, “Exhibitor” – the trade show for trade show people. I researched MC2 and learned that they were a major player in the industry, that their booth was the largest at the show, and that their staff ran the certification program for the “Fast Track” trade show management seminars. MC2’s goal at the show was to sell booth designs’ and construction. Nomad was already a player in the trade show scene, but this client had the potential to take us to the next level. A budget was proposed and approved and a substantial deposit was made. We know that best practices for trade show dictates that entertainments should last less than 3 minutes. All of our portable tracks at the time were designed with that in mind, but MC2 wanted something larger and curvier for 4 drivers. In addition, they wanted to keep track of the results each day for a substantial prize; a trip for 2 to the 24 Hours of Le Mans in France. Racing needed to be fast and fair with trackable results. Our design fit in the 10 by 20 footprint, with sinuous curves, elevation change and equal lane length. Still, to keep racing fair and close, we needed 4 heat races where each player drives each of 4 cars. With only three minutes between races minus time to explain how to play, there was no time to lose moving drivers from controller to controller. So, I proposed a system would run for 30 second heats, showing driver name on colored bars on elevated 360 degree screens. After each heat, the race control computer would need to trip relays on the track to coordinate the drivers hand controls to the screen and cars. This had never been done before on a slot car track and would require complex wiring. 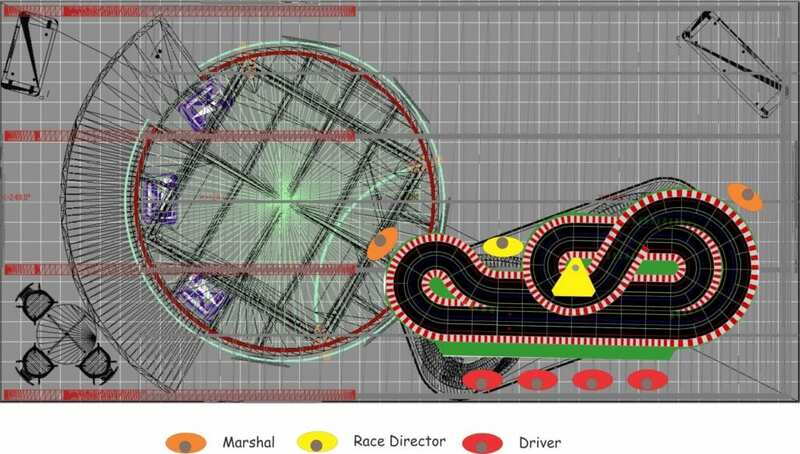 In addition, there would be a wireless microphone, strong speakers playing both track generated sound effects and a PA. Also, provision was made to show a brief client video on the monitors between races, and an autopilot system to run cars unattended during breaks. Quadrophenia undergoing wiring. 3 of the 5 sections. This would be the most complicated electronic system ever put into a slot car track. A Nomad club member volunteered to handle the wiring. Meanwhile, my contact at MC2, Henry, the chief designer, asked that the track build hold because he was working on cosmetic details and possible changes. We had detailed drawings of the elaborate two story $220,000 booth with its slot car track centerpiece, but approval to build was withheld until a week past our build deadline. When we were finally allowed to proceed, our team worked night and day. With only two days remaining, the complex relay system required to coordinate driver controls to the race scoring computer and displays did not work and its designer seemed defeated. Scotty, another Nomad Club member stepped in with a new design. By now the crew and I had been working as much as 18 hours a day. As the deadline to load the track in our trailer for the delivery to Las Vegas arrived, Scotty was still under the track working on the wiring. When the load-up time had passed, Scotty volunteered to work on the track in the trailer en-route! I told Scotty we were not arriving with a track that had never been tested. So, Scotty finished and we ran one test race then Quadrophenia was loaded for Vegas. Every bump in the road reminded me that were counting on hundreds of electrical connections to perform flawlessly. Load in and setup went smoothly, the track fit exactly as per the drawings and the booth looked spectacular. Test races worked great. The President of MC2 loved the track. All seemed ready when Henry arrived. “I don’t like the color and I think we should turn it the other way ‘round.” I pulled my project folder and showed him that we had matched the yellow Pantone color he had specified precisely, and it was placed exactly as per his drawing. “Yes” he said, that’s what I sent, but I don’t LIKE it. I want it turned around and painted grey. I looked toward the President, who deferred to Henry. So, Mike and I disassembled, moved and repainted. We finished in time for dinner and the first full night sleep in two weeks. Just as I got in bed, a call came in. “A forklift carrying piping, has hit the track knocked a hole in it and knocked it over, I think you need to come back for repair.” And so we did. MC2 booth plan. Three stories with curved stairway and overhanging balcony. Just before opening, the plastic covering was pulled from the white booth carpet. Mike volunteered to touch it up with the vacuum cleaner. Mike circled the track, then again, and “Where are all these black crumbs coming from? Mike was wearing foam soled “Hush puppy” dress shoes that had been in his closet for many years. The soles were disintegrating from exposure to the formaldehyde in the carpet that had been sealed in plastic. Within an hour, he was barefoot under shoe covers. No one would notice. The show was about to open. The doors opened. A group obviously including an entourage and press headed straight for us, three TV cameras and reporters. The object of all the attention steps up to me and says, “This looks like fun, I think one of these should be installed in my office. I know a little boy who would like to play, do you mind?” “Of course sir.” I say, as an 8 year old appears, wearing a real Ferrari drivers suit. No Halloween costume, this is the real thing, down to the shoes. Hmmm…. I set up the race, cameras all line up. This is a lot of pressure for Quadrophenia’s first race. The race goes perfectly, the kid wins. I remember one of my spare cars under the track, is a Ferrari F1 in a nice display case, so I pull it out and award it to the kid. As I look up I see the MC2 staff cheering and I get thumbs up from the Prez. Quadrophenia in action on day 2 viewed from the balcony. The Ferrari kid is back. Quadrophenia was a hit and has been so at every appearance since!